The Lighter Side Co.® is a division of The Johnson Smith Company®, one of America's oldest catalogers. 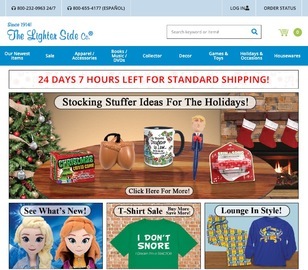 Launched in 1979, Lighter Side offers lighthearted gifts and a wide selection of licensed and nostalgic collectibles. Click a Coupon or click Start Shopping to earn 10% Cash Back at The Lighter Side.